Well, it's official (and by official, I mean I've said it, which means it's not really official, but this is my blog so I'm treating it as such)... Games Workshop screwed up. Shadow War: Armageddon is a disaster. And no, I don't mean Games Workshop went and did a Dreadfleet, and produced something that people refused to buy. I am quite certain that from a business perspective, the game's been something of a success. I certainly don't mean it's a disaster in terms of the long-term impact on the company's reputation either. They seem to have weathered any cries of dissent without any significant long-term impact on who they are and what they do. I don't even mean a disaster for me personally. But it's still a disaster. Once upon a time there was a game called Necromunda, about gangs fighting turf wars in a sprawling Underhive. One day, Games Workshop decided to release a new edition of Necromunda, but brought up-to-date with a new setting and incorporating the various factions from their established Warhammer 40,000 product line. Fans got incredibly excited. And when it became apparent Games Workshop was releasing new terrain to go with the new game, that excitement became palpable. Then Games Workshop released the game for preorder... and sold out within 10 minutes. There was, of course, much wailing and gnashing of teeth (even from me, and I managed to get a copy of the damned game). It was, perhaps somewhat fittingly for a game with Armageddon in the title, the end of the world. The response was absolutely justified, because the Shadow War: Armageddon boxed set is a thing to behold: The terrain is beautiful, there are enough miniatures to put together decent space marine scout and ork boyz teams, the templates are the sturdy plastic ones that people are going to recognise from older editions of 40K, and the rules book is a treasure, with lots of background information, fantastic artwork, and photographs of painted miniatures fighting across that gorgeous terrain. And yes, I'm going to keep mentioning the terrain, because it really is the defining aspect of the game. It's the thing that makes Armageddon stand out (and stand up) in the crowded tabletop miniatures market, and it's truly a character in its own right, with a very real impact on gameplay (but more on that later). Games Workshop's initial response to the furore, wasn't ideal. They said all the terrain was going to be available in individual packs (for a significant markup, of course), and they would look into making the rules available in another format, probably as a PDF. After a few more days of red hot Internet rage, the official announcement came out: Games Workshop were releasing a separate edition of the rules book for the people who missed out on the boxed set. The new rules book even contained a bunch of extra content that was previously available for free download from the Warhammer community website. Now, there are at least two ways to look at this situation, and I wouldn't want to claim which viewpoint is right. Viewpoint one is we take Games Workshop's word that they didn't expect the game to be as popular as it was. If we do that, we have to believe that Games Workshop really ramped up the excitement for the "second coming of Necromunda" yet completely failed to realise how significant the demand was for such a product. Furthermore, we have to believe that they were able to overhaul, print, and re-release the rules book within just a few weeks of the initial release. That's the kind of recouping Mr. T would be proud of. The second viewpoint is a bit more cynical, and involves believing Games Workshop were doing a lot less stuff for the good of the players, and a lot more stuff to maximise profits by forcing people to buy the individual components from the boxed set for a significantly higher sum. But regardless of how you look at it, the result's the same: People who want to play Armageddon have a way to get all the materials they need to play. So, all's well that ends well, right? Making a separate rules book and separate terrain packs is a very good idea. It's perfect for people who already have the miniatures they want to use and have stacks of scenery gathering dust between their games of 40K. But it's my personal opinion that people are more likely to try out a new tabletop miniatures game if they have a path of least resistance: A way to try the game out by getting all the things they need in one place. In other words, a starter set. The Armageddon starter set was perfect. Sure, it was pricey, but it was also a hefty chunk of all the things someone completely new to the hobby needs to start playing. And it was still cheaper in the UK than that bloody Runewars Miniatures Game. But now... Now new players who want to try this game need to buy terrain and miniatures, source templates and dice, and even make their own tokens, just to get the game onto the table. That's a big ask for people who aren't 100 percent certain they're going to enjoy the experience. So, there's a reason I call the game a disaster (and it's not just to have a shocking introduction to my review, although I'm obviously never going to miss an opportunity for a catchy hook). It's a disaster because it cannot live up to its potential. 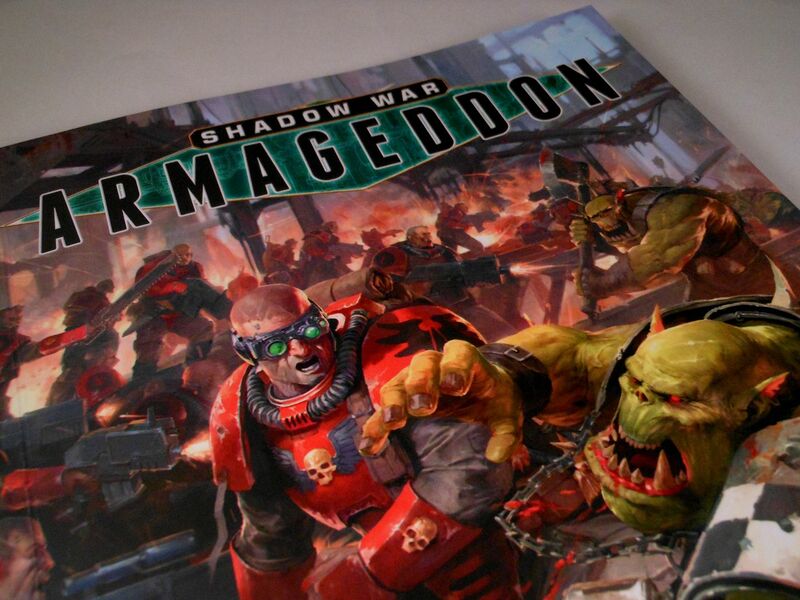 With Armageddon, Games Workshop has an amazing way to introduce new players to the world(s) of 40K. They have a product that's the perfect stepping stone towards the next stage of the hobby. It isn't a gateway game, it's a sucking great black hole with the potential to hoover up players and spit them out in an entirely new galaxy. But without a starter set, it's not going to draw in new players. It's not going to be a sustainable title in its own right. A lot of people who might have really enjoyed the game may never even get to try it. And that's a real shame because (and I cannot stress this enough) Armageddon is exceptional. It could have been so much more than what it's become. But it is what it is, and what it is is what I have to review. That's why, at this point, I need to pause to gather my thoughts. Reviewing a tabletop miniatures game is tricky, especially when it doesn't have a starter set. Such games tend to have a lot of complex rules (at least in comparison to a board game), making it difficult to succinctly explain how the game works; and as people are all using different factions (many of which I've never personally used), it can be difficult to let readers know what kind of experience they can get "out of the box" (not that there is a box). But I'm a reviewer. I'm a professional. I'm (not really) a professional, so I've got to say something. So, let's forget what Armageddon isn't, and talk about what it is, and what you need if you want to play. 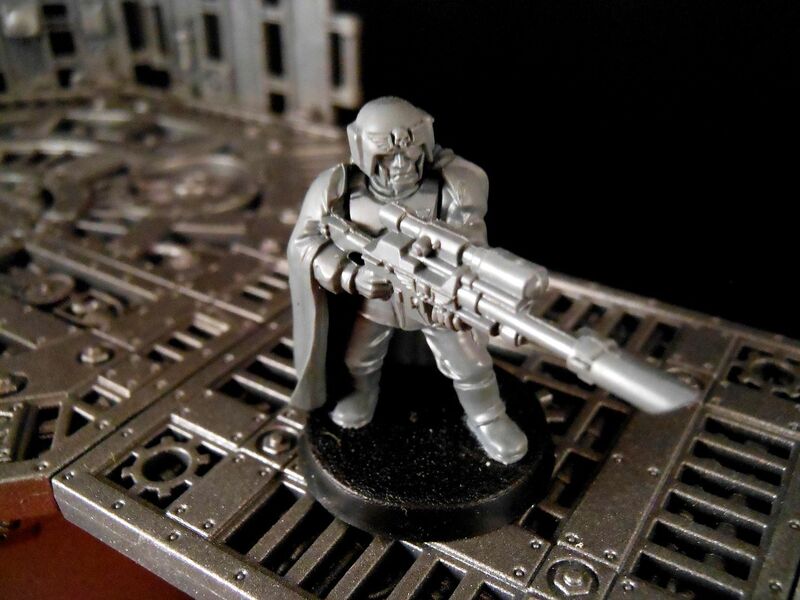 At it's heart, Armageddon is still Necromunda. At least, I think it is. The truth is, I haven't played Necromunda for two decades. A lot's happened in that time, not least the onset of senility, which has somewhat muddied my recollections. But from the recollections I do have (which predominantly consist of arguing with my best friend over line of sight from towers, and ripping enemy models to bits with my mohawk-wearing stubber-toting Goliath heavy), Armageddon holds quite faithfully to what made Necromunda great; but then it takes that classic recipe and adds sprinkles. In this case, the sprinkles are the various 40K factions everybody knows and loves (or loathes, depending on your allegiance). Where Necromunda was all about gang warfare, Armageddon is about small groups of elite guerrilla warfare specialists, fighting over vital supplies in the ruins of a war-torn industrial planet. The change in scene is the perfect excuse for Games Workshop to launch a new line of industrial terrain; but the change is much more than cosmetic. It opens up possibilities, allowing existing 40K players to dive into the game with whatever miniatures they already collect. If you're totally new to 40K, getting started is a little more difficult. At the very least, you need the Armageddon rules book and a unit box for the faction you want to play. Unfortunately, while that one box is going to give you a good start, it's very unlikely to cover all the options you want. 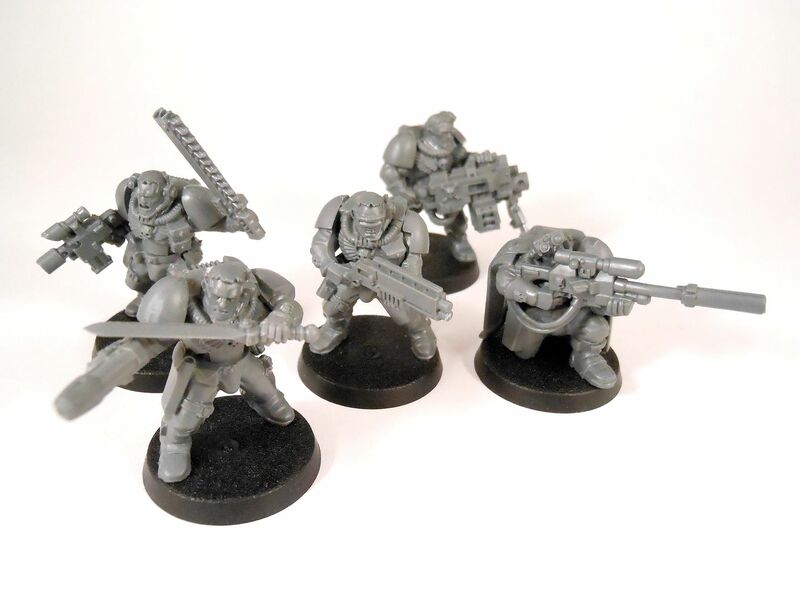 For example, if you want to run a space marine scout team, you're going to need at least one box of regular scouts, and one box of scouts with sniper rifles. Even then you're going to be missing options such as power swords and plasma pistols. As another example, I thought a box of 10 cadian infantry I had lying about was going to be perfect for this game. It gave me one leader with a laspistol, one grenade launcher, one flamer unit, and seven grunts with lasguns. 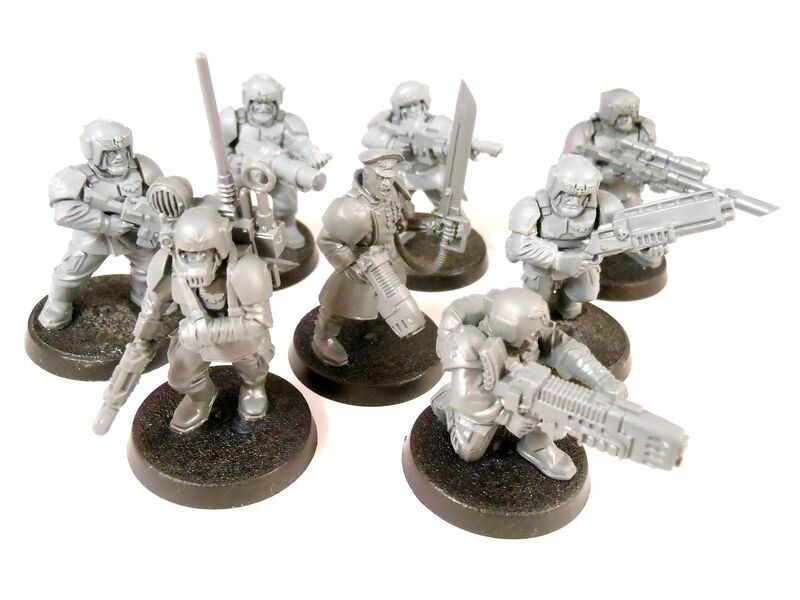 Turns out, to get my kill team up and running, I had to shell out for a cadian HQ box, comprising five additional figures with options for plasma guns, meltaguns, bolt pistols, power swords and sniper rifles. Even then, I didn't have any shotguns, so I had to make conversions using leftover shotguns from my space marine scouts. Personally, I thoroughly enjoyed making my kill teams, both assembling the models and working out the loadouts for each unit. Figuring out synergies, and running through potential strategies for different team compositions is something I find very compelling. But, of course, I'm the first to admit I'm a bit weird. But anyway... Once you've sorted all that out, it's time to think about terrain. Armageddon is a game about terrain. I mentioned before that the terrain is a character in its own right, and I mean it. I've never played a game where the battlefield is such an integral element of absolutely everything you do. Of course, playing any miniatures game involves learning how to use scenery to your advantage; but here the terrain feels like an active participant in every firefight. It cradles you protectively from enemy fire, thrusts rival snipers into vantage points above the killing field, and even betrays you, dropping your fighters into the void when they are gunned down on a walkway or tower. You win or you lose based on how you use the scenery: On how much you understand about the gritty world of Armageddon. The game's theme is baked right into the tabletop, making it essential for you to get into the mindset of a team of guerrilla warfare experts who have learned the lay of the land, and know how to become one with the environment. It's beautiful game design that makes every tabletop a narrative force that drives the story you and your opponent create. Of course, it's also potentially expensive game design. 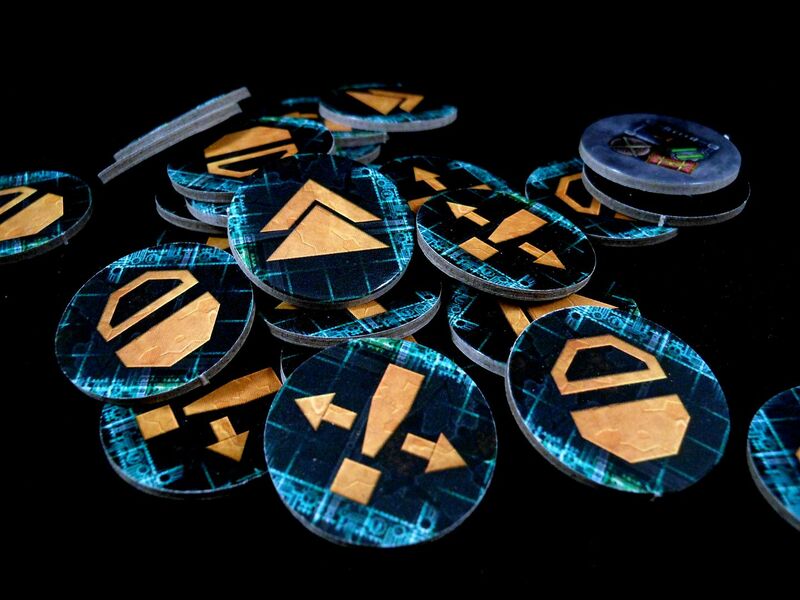 The more terrain you throw onto the table, the better the game gets; and that means you're going to want to buy more. You're going to want more walkways, more towers, more ground cover. More everything. But hey, it's the best war game terrain I've ever seen, so you're probably not going to be too upset; especially if you also play 40K. 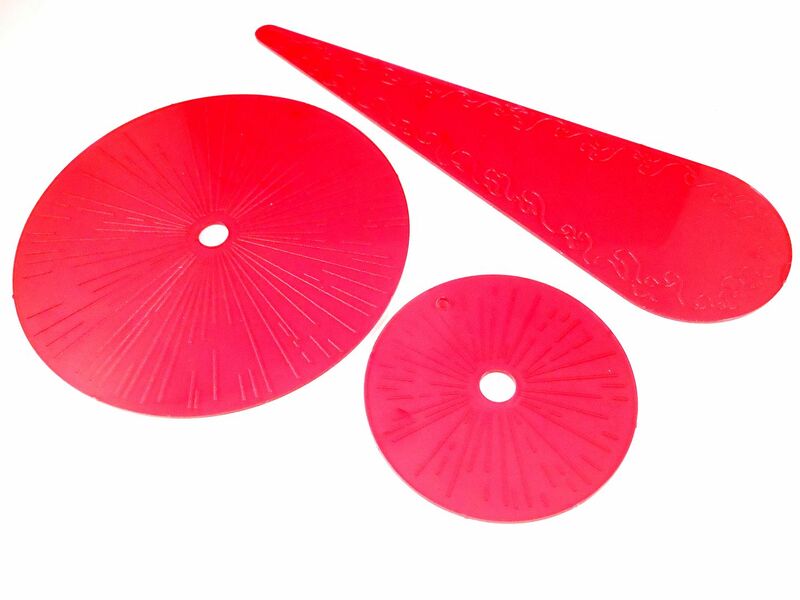 If you can deal with all that, source some round and teardrop templates for weapon effects, buy scatter and artillery dice, rustle up some tokens from somewhere, and grab a tape measure, you're just about ready to start playing. 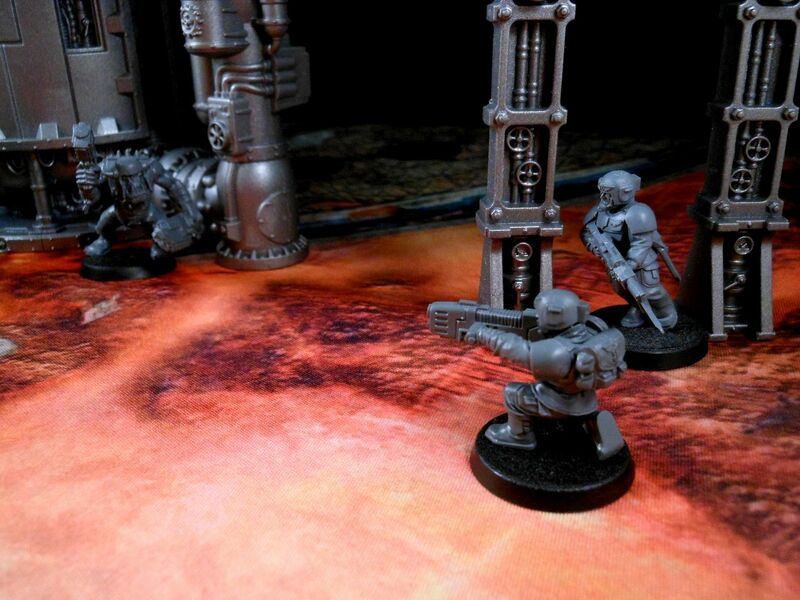 You and your opponent create a kill team using a points system and a set of team-building rules, then you pick a scenario, set up the terrain and go nuts. The scenarios each have their own rules and winning conditions, and range from straight up firefights to scavenger hunts and even rescue missions; but regardless of the scenario, it always comes down to the same thing: Hitting your opponent fast, and hitting hard enough to ensure there's no chance for you to get hit in retaliation. Flow of play is relatively straightforward, with players alternating turns to move and act with their entire teams. This style of play is a throwback to the Necromunda days, and isn't that common in modern skirmish games where alternating activations of individual models is the norm. Personally, I think Armageddon's play style works well because it suits what the game is trying to achieve. Alternating activations make sense in a game where each model is a totally unique character with very different skills and weapons, but in Armageddon you are in control of an efficient fighting force. It's a well-oiled machine, comprising fighters at the peak of their skill, working synchronously to achieve a common goal. By moving your whole team at the same time, you get to formulate strategies and watch how they play out in real time. A team's turn starts with a movement phase, which involves every model moving (well, duh) up to their movement value (well, double duh) or else running at double speed but sacrificing the opportunity to shoot later in the round. The movement phase is really where most of the strategy happens, and where you really learn how to interact with the terrain. If you make a regular move and finish out of sight of the enemy, you can go into hiding, making it impossible for the enemy to target you; if you have enough movement you can climb ladders to reach vantage points for sniping the enemy, but at the risk of putting yourself on a precarious ledge from which you may fall if you take any return fire; if you are within range of enemy models you can charge into close combat; and always you need to keep checking your lines of sight, because the enemy may be sitting on overwatch, waiting to gun you down as soon as you move into the open. Movement is tense and exciting, and charging across the open battlefield is a sure way to meet a grisly demise. You need to move cautiously, clinging to the shadows, biding your time, waiting for the perfect opportunity to strike. And strike you shall, because once you've moved all your models, you get to start shooting. This is pretty simple stuff: Check for line of sight, check for range, roll to hit, roll to wound, roll for armour saves. But always, always, you're fighting the terrain as much as you're fighting your opponent. Did you get your sniper into a high enough position to take the shot? Is your target hunkering down behind a barrel making it harder to hit? Don't worry if you can't find a target, you can instead choose to enter overwatch, giving you a chance to shoot down anyone foolish enough to walk into your crosshairs later on. One of the most interesting rules about shooting is that you must always shoot at the closest enemy if it's easier to hit than targets that are farther away. This is a way of simulating how combatants in a small skirmish are going to value self-preservation over taking a tactical shot at a more distant yet more valuable target. It also creates options for strategy, as you string together some of your cannon fodder into a defensive line to protect your heavy units and leaders. For swarm teams with numbers to burn, "Operation Human Shield" is very much a valid tactic. The other interesting thing about the shooting phase is the way it handles injuries. This being a skirmish-level game, combat isn't quite as deadly as it is in games played out in a larger theatre of war. 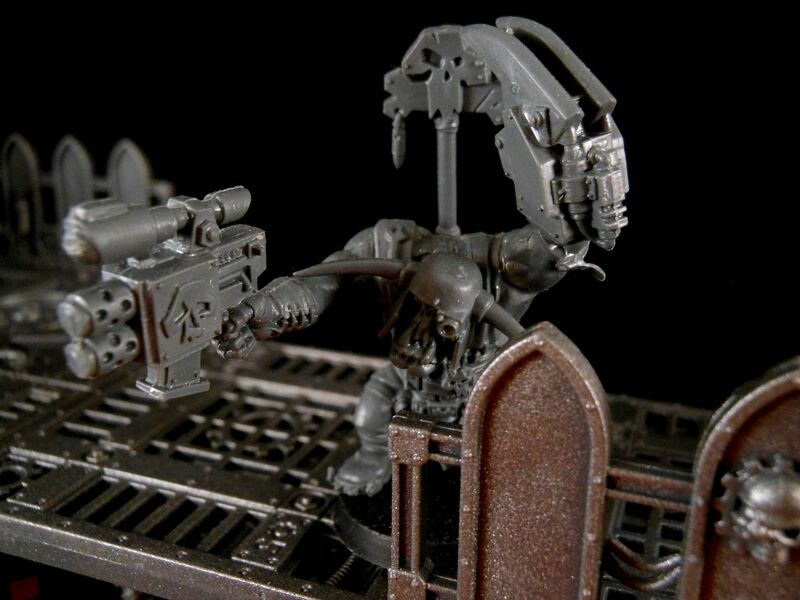 Models may be able to shrug off damage that would remove them from the board in 40K, and even a model reduced to zero wounds isn't necessarily dead. At the point models run out of wounds, you roll to see what happens to them, and in many cases, they simply hit the deck and spend a while rolling around squealing like professional football players. It's even possible they may suffer flesh wounds that impact on their combat prowess but otherwise allow them to continue fighting. However, regardless of the outcome of a successful hit - whether it pings off the target's armour or takes out a kneecap - the recipient of enemy fire is always pinned. This simulates the effects of suppression fire, as the target dives for cover or is temporarily winded. Models automatically recover from pinning fire eventually, and even have a chance to recover early; but the suppression fire may still rob them of precious activations. Even though you aren't necessarily killing your targets, if you can heap on the pressure, you have a chance to dominate the battlefield and control the flow of play. Next, there's a round of close combat. Unlike the movement and shooting phases, which are only for the current team, the close combat phase is an opportunity for all of the models in base contact to exchange blows simultaneously, hacking at each other with knives, or shooting pistols at point-blank range. 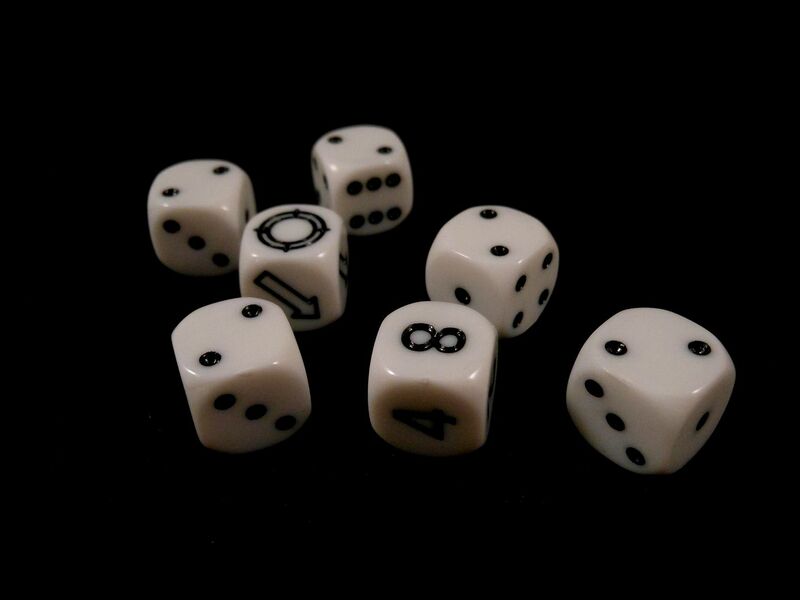 The process involves both combatants rolling dice equal to their number of attacks, with models armed exclusively with pistols and close combat weapons gaining an additional attack from their specialist loadouts. Each player picks the highest score, adds various modifiers, and then compares the difference to determine the number of hits the winner inflicts. Then the winner rolls for dishing out wounds. What makes close combat so dangerous (and so much fun), is the additional risk involved. If one of your models goes down in a hand-to-hand fight, it's lights out. No pinning, no red card-worthy amateur dramatics, and no mercy. The model gets removed from play, and that's the end of that. It makes close combat exceptionally deadly, and gives it a visceral edge that is totally in keeping with the idea of hardened veterans doing what it takes to survive in a war zone. Once the teeth have hit the pavement, there's a recovery phase in which you have a chance to rally broken troops, or where you may have to make a bottle test to see if you flee the battle after taking too many casualties. This is also the point where your downed fighters may pull a Boromir and stand up for one last attack, or just pull a Boromir and bleed out in the dirt. After that, play passes to your opponent, who goes through the same phases. This sequence continues until one team bottles out and flees, or one team fulfills the objective defined by the scenario. Of course, there's a lot more to the game than that. It's a miniatures tabletop game, so there are plenty of nuances to the rules, and opportunities to pull off those heart-pounding, fist-pumping plans that turn the tables, creating memories you talk about for months (whether your opponent wants to hear it or not). Ultimately, this is a game that delivers on its promise. This is a game that understands its theme, and knows how to integrate that theme into every aspect of the design. This is a game about dirty, gritty, down in the mud street-fighting. For anyone who follows my blog, or has checked out any of my previous articles on Armageddon, the fact I love the game should come as no surprise at all. I suppose part of that is nostalgia; after all, I think nostalgia is a powerful force, and it would be remiss not to at least acknowledge how I suspect it colours my opinions. But it's more than that too. There is something very appealing about the idea of the game. Take creating a team, for example. The act of building something, of making those decisions that define your forthcoming gaming experience, is something I've always enjoyed. I used to generate heroes for roleplaying games I never played, just because. I enjoyed rolling up the statistics, and figuring out what that hero would do and how he or she would fit into a band of adventurers on an epic quest. And then there was Warhammer Fantasy Battle... I used to spend more time building army lists than actually playing. Armageddon taps into that same creativity I love so much. There is something incredibly appealing about choosing a faction, and then stretching your 1,000 points to breaking point to squeeze in all the options you think you're going to need. And that's even before you think of a backstory for the team, and name all the characters. Because that's a big thing right there: Naming your team. Skirmish games such as Malifaux and Anima Tactics involve small groups of pre-generated characters. You can come up with a reason for them to fight, creating a background for the conflict, but ultimately those characters aren't your's. They already exist in the narrative of the game's universe. You may guide their course for a while, but in the end you are just a temporary master. Conversely, Armageddon gives you a chance to drill into the creative process, crafting every element of your team. Why are they fighting? Why does the leader always carry a power sword? It's all up to you, and it presents you with a reason to make that oddball miniature conversion you've been planning since forever. Then you start playing, and all those characters and all those plot points you created, take on a life of their own. Because even though this is a game about a single war, it's more importantly a game about countless little battles. While it's possible to enjoy pick-up-and-play experiences for one-off fights, Armageddon really comes into it's own when you play through a campaign. The campaign rules are relatively straightforward, and represent the biggest deviation from classic Necromunda rules. They give you a reason to fight, and then afterwards they give you a simple sequence of events to control how your ragtag team of battered warriors copes. This involves rolling to see if downed units recover, recruiting new fighters, stocking up on equipment, and gaining unique skills that give your fighters new ways to get the drop on their enemies. The campaign structure really makes Armageddon something wonderful. It's very rewarding to watch your team succeed, and more than a little heartbreaking to see it falling apart when things get tough. However, the system's not without its faults. I would say it works much better as a story creation tool than it does as a way of maintaining a balanced and interesting campaign. 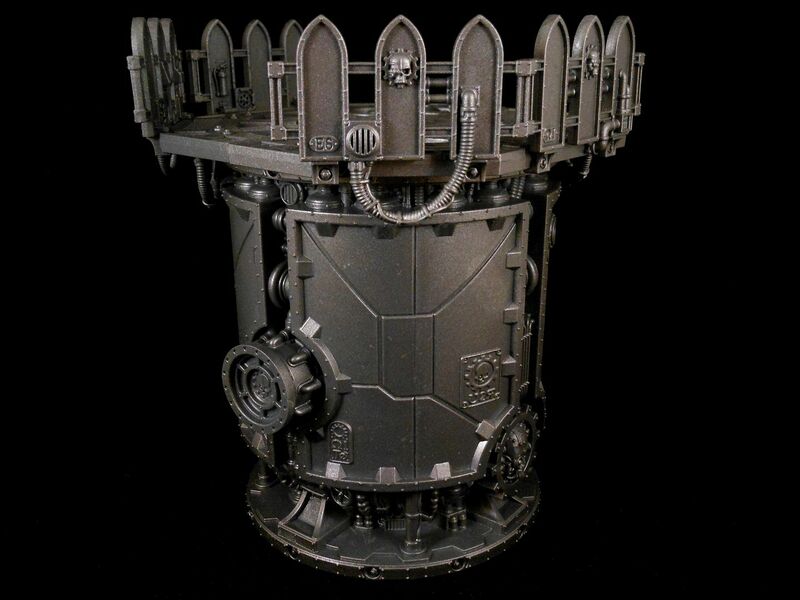 Basically, the aim of the campaign is to get 15 promethium caches, which are general McGuffins awarded after every fight for winning (and, indeed, losing) and for achieving certain objectives. For example, if you win a fight, you get D3 promethium caches, plus any you earned during the game. If you lose or draw, you only get one cache. Turning the campaign into a race to 15 points isn't particularly compelling, and it can be problematic in campaigns where some teams don't fight as frequently as others. Promethium caches are also the way in which you employ specialists, which are powerful models that fight with you for a single battle. I'm really not keen on their inclusion in the rules, partly because they feel like an excuse to encourage people to buy more miniatures than they really need to fill out slots they won't use that often. More importantly, they accentuate a "rich get richer" problem within the campaign setting. As a simple example, consider a campaign with three teams. In the first fight, Team A fights Team B. Team A wins and get three promethium, and Team B gets one. Team C didn't fight, so doesn't get any promethium. In the next match, Team A is facing Team C, but now Team A can employ one or more specialists to tag along, greatly improving the chances of winning again, and therefore acquiring even more promethium. To make matters worse, Team C doesn't get any kind of underdog bonus. Games Workshop obviously foresaw this problem to a certain extent, and made it so that you must fight your final battle to win the campaign without employing specialists, giving your opponents a chance to claw back the difference; but by then it may be too little too late. It's possible I'm missing something in the rules, but I feel like the campaign doesn't quite fit together as well as it should. It's fantastic for developing the story of your teams, for creating an immersive plotline that sees your characters evolving over time, and for giving you reasons to get in these fights in the first place. It's amazing to see a tale unfold, as grudges are formed and grudging respect earned. For someone like me, who craves a story to care about, it's exceptional. For a start, teams that aren't involved in the immediate conflict need some way to generate income or promethium to reflect their "behind the scenes" activities while the others are fighting. It would stop one team lagging behind if a player couldn't make it to games night for a few weeks. There also needs to be some kind of underdog rule, such as allowing the inferior team to take one free specialist, or giving them one extra promethium after the fight. Those things might help, but they don't really address what I feel is the biggest failing of the campaign: The fact it's just a race to 15 points. There needs to be something more than that. Maybe a campaign map with regions that you acquire as you win fights, with options to expand your territory, or give up untenable positions in exchange for benefits elsewhere. Or maybe even unique goals or secret agendas for each team. I don't have the answers. I don't claim to have the answers. But I feel the answers are out there, and it would be possible to take the campaign up a notch with just a little more effort. Besides that, I think the game is incredible. It's something that appeals to me on a deep level. Something that allows me to create stories, develop characters, and go on a journey. But part of that journey is into the past, and that's something anyone new to the game may need to consider carefully. For all the shiny new terrain and faction integration, Armageddon is a relic. They dug it up, dusted it off, and restored the bits that looked a bit worn; but apart from the overhauled campaign system it's still pretty much that old game that I played two decades ago. For some people, that beautiful hit of nostalgia is going to be a strong selling point; for others, the thought of rolling out an ancient rules set when there are so many newer, shinier games to play is going to be a major turn off. Perhaps it will be even more of a turn off than the lack of a bloody starter set. 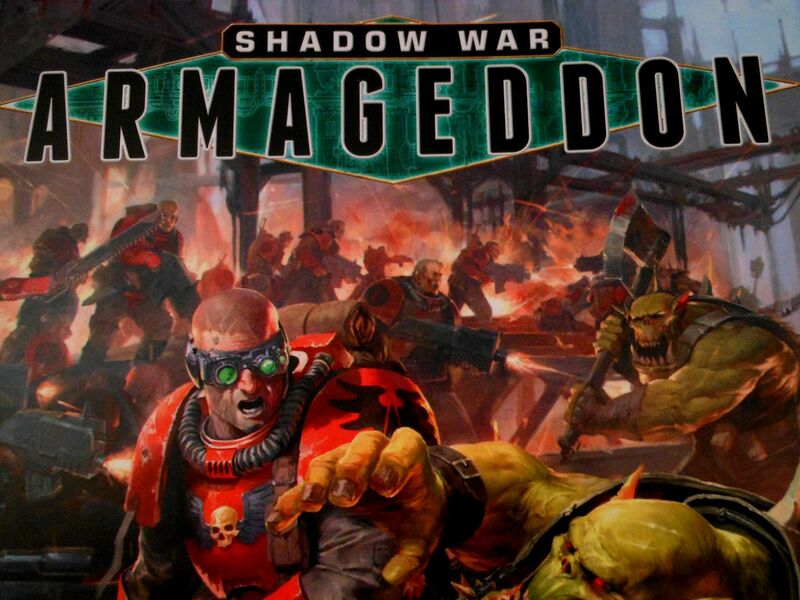 The rules book, terrain, and miniatures you need to play Shadow War: Armageddon are available from Games Workshop and all good game stockists. If you enjoyed this review, please consider supporting me on Patreon. For as little as $1 a month, you help me to produce more regular content, and you'll gain access to exclusive videos too. Yes, it frustrates me no end that a perfect starter game, something that could bring new people into the hobby, sold out in seconds to an audience of existing gamers. This should have been on the shelves of toy shops, like HeroQuest was -- how many thousands of people did that game ensnare? -- but instead it went into the collections of veterans, the very people who wouldn't think twice to buy the individual components direct from GW. All that said, I can't wait to try it. Yeah. 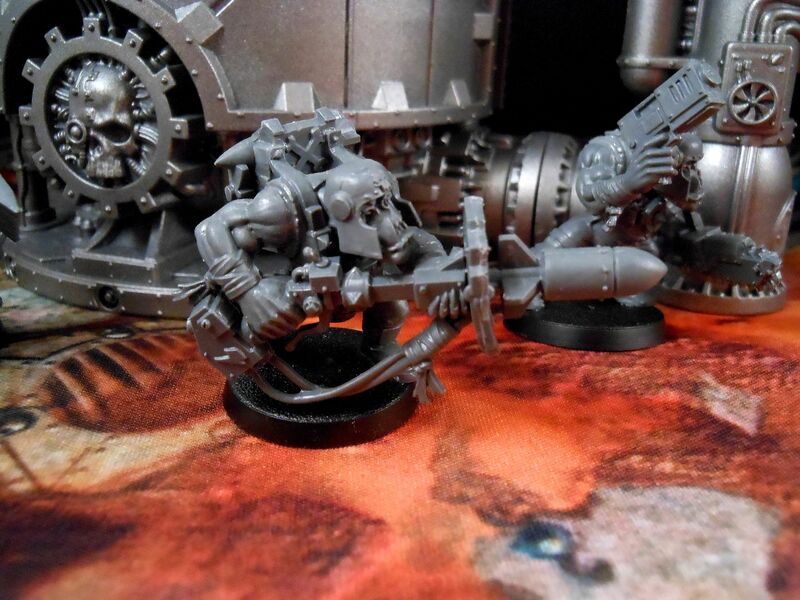 It sold out to people who complained about the old space marine scouts and orks because "everybody has them, and they're really old," and those people probably flipped everything except the book and the terrain on eBay. That's a real shame, because the contents are perfect for anyone completely new. And the game is so damned good. Thanks as always for reading and commenting.